Chocolate cups are shockingly simple to make. 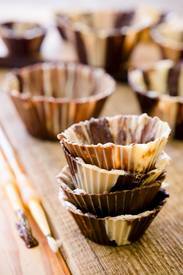 In fact, making chocolate cups is a fun activity for kids and adults alike! These chocolate cups are perfect for filling with peanut butter, candy, ice cream, fresh berries or mousse. Cupcake Project shows us how to make these pretty treat cups with your favorite chocolate.